Some birders like to see just birds, while others like birds, but don’t mind stopping or even taking detours to see other creatures along the trail. I lean towards the second group. I like to see birds for a long time and hear their vocalization; even if these are common species. In my last pelagic birding trip, I learn I could not do neither see birds well nor hear them; I learn that pelagic birding is not my cup of tea. A couple of months ago I took a true pelagic trip off the coast of Peru. 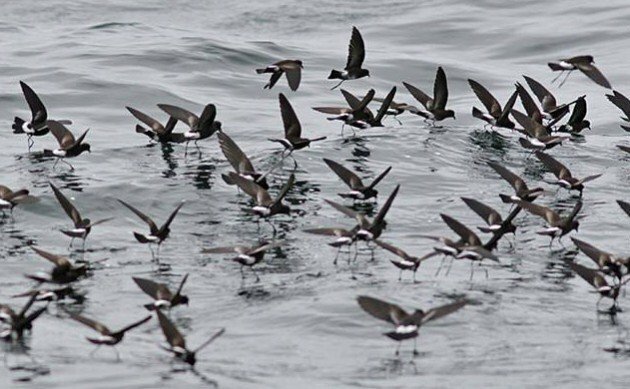 I had taken several mini-pelagic trips, those that don’t go far off the coast where one sees large flocks of common birds flying overhead, diving for fish, swimming around the boat, and doing other cool things. In comparison, what I call a true pelagic trip was one that had as ultimate prize storm petrels, shearwaters, jaegers, skuas, tropicbirds, albatrosses, and other unexpected surprises seldom seem near the coast. This trip took us about 31 miles off the coast. As they say, the success of a pelagic trip hinges on the size of the boat, number of people on the boat, weather conditions, and the guide. If there were anything to complain, it was the boat being a bit small or put differently, there were too many of us on it. Other than that, the weather was fantastic and the Pacific Ocean was unusually calm according to the captain. And there it was, a distant fast-flying silhouette. And so on. Ok, I had studied the storm-petrels, but these were distant and I could not get a long enough view at them to test how well or badly prepared I was. As if the bouncy flight of the storm-petrels were not enough, the combination of a rocking boat and my 10×40 Zeiss binoculars resulted in a shaky affair that made me sick real fast. We finally got to the point where we started to pour the chum. 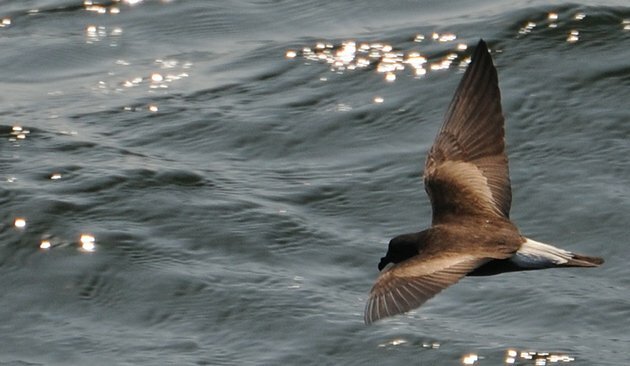 More storm-petrels began to show up to the chum. At that point, I had already been tracking the bouncy storm-petrels for while and started to feel funny. I could not see through my binoculars for more than five seconds. It began with the shallow yawing and a cold sweat. I was getting sick and decided to get down inside the small hood on the boat and look down at the floor, while mostly Elliot’s and Wedge-rumped Storm-Petrels congregated over the chum. By the time Markham’s and Black Storm-Petrels showed up and folks above were discussing the differences between these two very similar species, I was about to throw up. I had seen a distant Markham’s Storm-Petrel that was shown to me by the tubenose expert aboard. I saw at least two Black Storm-Petrels and at one point I forced myself to see the difference in flight pattern. I had studied up these two species beforehand, but I felt worse every time I tried to see the birds, even without my binoculars. Elliott’s and Possibly a Markham’s Storm-Petrels (bird on the left). Photo: Favio Olmos. Pelagic birding was so different. It did not really feel like birding or at least I am not used to this type of birding. Birding is supposed to be fun. Even after seeing the silhouette of a distant and fast fading Waved Albatross, a bird I wanted see so badly, I was not convinced about the experience. 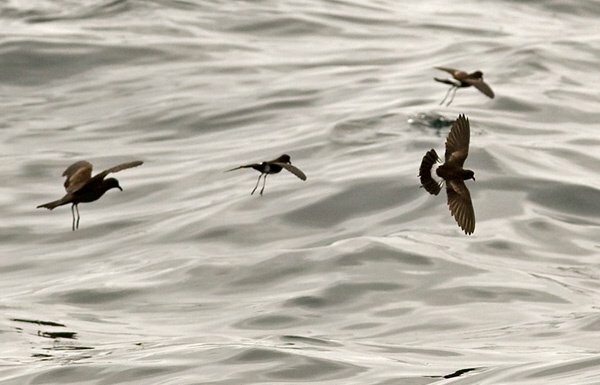 When it comes to pelagic birding I would rather stick with mini-pelagic trips. I would say pelagic birding is somewhat half birding. One can barely see the birds long enough to make something of them and it is mute. I may be biased by the fact that I do a lot of birding in forested areas where sound is essential. 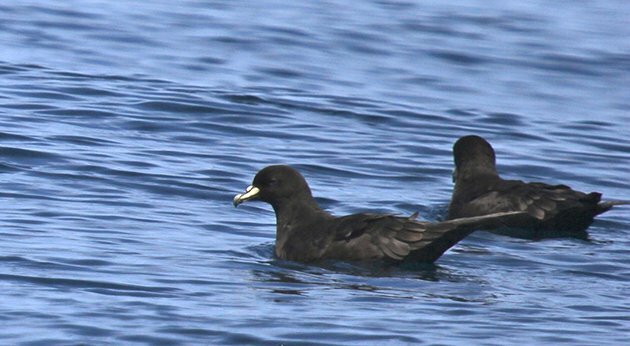 For someone who wants to tick these species, the nuances of pelagic birding justify the end. I rather stick with birding experiences where birds vocalize, perch, and I can see for a long time from a firm surface. I’m with you Alfredo. My first pelagic was. 12 hour trip to the continental shelf off of San Francisco. A vomitous affair with tiny distant birds. What saved it was getting to see (smell) the Farallons up close and experience the breath of a Humpback whale. Happiness was firm ground and a perched bird. I see the appeal and I wish I had the constitution for pelagics. Perhaps a calmer day would have done wonders. Hey Walter, perhaps after going back on more pelagic trip we may get the hang of it. Other folks seem to enjoy them. With some experience, being able to ID distant fast flying birds must be rewarding. As for getting sick, I am not sure going on more pelagic trips help. Not all pelagic trips are created equal! Perhaps try one with another operator, in a larger boat, in a smaller ocean (like the Atlantic). And never go below-decks when you are feeling sick – stay outside and look at the horizon. Also – 8x or 7x binoculars would probably serve you better than 10x. I fully agree Nate, the small boat and my 10×40 binocular did not work on my favor. Thanks for the tips. I should give it a try, this time better prepared. I think this is strictly a different strokes for different folks type of situation. I don’t get motion-sick, but I do have poor hearing. I can watch silent birds from a rocking boat all day but I won’t even count heard-only birds for my life list since I’m wrong or tricked by mockingbirds so often. Fortunately birding is a diverse and adaptable sport. That’s probably the best part of our sport Carrie. We enjoy it in different ways. We can enjoy birding for a very long time either by walking, and if unable, on wheelchair. I am glad you use the word “sport” to describe birding. I wish more of us did this. It takes such a skill set to get good at it, and involves mental and physical fortitude!